Don Sutherin was a wily defensive back and a premier place kicker during his 12 seasons in the Canadian Football League. ‘Suds’ led the Eastern Conference in scoring in 1961 with 69 points, 1964 with 94 points, 1965 with 82 points and 1968 with 112 points. 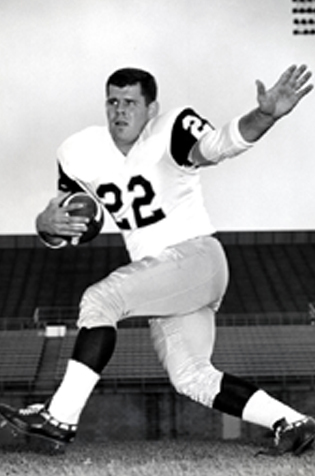 Sutherin was the Eastern pass interception leader in 1961 and 1962, and was also the CFL kickoff leader in 1969 with 3,686 yards on 65 kickoffs. During his career, Sutherin scored 714 points and intercepted 58 passes. During his career, Sutherin participated in 22 playoff games, scoring 123 points, and intercepted 12 passes for 147 yards. Sutherin played in eight Grey Cup games and was a valued member of four championship squads.